We’re a nation of asthmatics, with the CDC estimating that one in every 12 adults and one in every 11 children are diagnosed with asthma. And with that number on the rise, the use of asthma inhalers is projected to skyrocket… but are inhalers really the safest and most effective way to treat asthma? The average doctor would certainly think so. A 2011 study estimated that 80 percent of children with moderate to severe asthma were prescribed corticosteroid inhalers, and that percentage is likely to be just as high for adults. Doctors see asthma inhalers as the first line of defense against symptoms of wheezing and shortness of breath, which means that most asthma sufferers rely primarily on inhalers for the treatment of their symptoms. I can even remember back to a time in my own childhood when I would carry around an inhaler, having been taught to take a couple pulls on it whenever I was beset with a fit of coughing or wheezing. I’m fairly sure that my asthma was on the mild side (it eventually went away completely after I changed my diet), but here I was dragging away on my “puffer” at least a few times a day. Most people think nothing of it, but a growing body of research shows that asthma inhalers can be horribly damaging to our health — even when used infrequently. Here are five reasons to stay off inhalers, and what to do instead. A study published last week in the New England Journal of Medicine revealed that increasing inhaler use didn’t provide any improvements in asthma symptoms. As part of the study, 254 children with mild to moderate asthma were either given a low inhaler dose or an inhaler dose of four times the usual amount. There was almost no difference in severe asthma exacerbations between the two groups, suggesting that inhalers aren’t nearly as effective as you might expect, particularly with regards to more severe cases of asthma. That same study published in the New England Journal of Medicine also reported something that shocked me to the core: inhalers can significantly stunt growth in children. Over the course of 48 weeks, researchers noted that increased inhaler use stunted linear growth by an average of 0.23 cm per year. While that might seem like much, if that rate of growth suppression continued throughout their developmental years, our children could be suffering from serious growth defects at the hands of their inhalers. Interestingly, this discovery is nothing new to scientists, with an 18-year-old study finding that budesonide inhaler use of 400 micrograms a day over six months resulted in a mean decrease in height of 0.23 cm… sound familiar? I’m sure glad I stopped using my inhaler when I did! A growing body of evidence shows that long-term or high-dosage inhaler use can significantly lower bone density, leading to diseases like osteoporosis. A study published in the Journal of Open Respiratory Research showed that asthmatics who had been using an inhaler for at least a year or at higher doses for shorter periods had significantly lower vertebral (spine) bone density than asthmatics who had never used inhalers. Another study demonstrated similar results for the spine, along with bone density decreases at the top of the femur (thighbone). One of the most common side effects of inhaler use is oral candidiasis… a.k.a. thrush. A study that compared asthmatics who used inhalers against asthmatics who didn’t use inhalers and healthy volunteers found that Candida species were significantly greater in the inhaler group. Another study showed that oral candidiasis was present in 10.7 percent of children using inhalers. Yup, you’re inhaler could give you a yeast infection. Fortunately, there are other ways to treat asthma without compromising your health. Much of these methods involve building a healthy immune system and alleviating systemic inflammation in the body, both of which are big contributors to asthma in the first place. 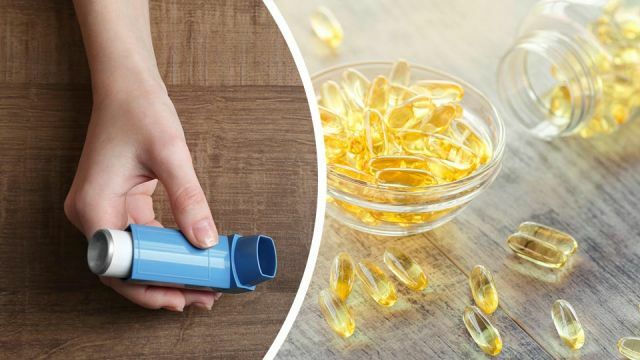 Perhaps one of the most studied of all the alternative asthma therapies, good old fish oil remains an excellent choice for anyone wanting to treat the causes behind asthma. Fish oil is ridiculously high in omega-3 fatty acids — compounds that have been shown time and again to dramatically lower inflammation in the body. And because asthma manifests as inflammation of the lung respiratory passages (bronchioles), less systemic inflammation is definitely a good thing. Once again, we find ourselves back on the anti-inflammatory doorstep. This time, however, it’s about avoiding foods that can lead to allergies and inflammatory reactions. In particular, foods containing gluten are a big no-no, along with hydrogenated oils and fats, and excessive sugar. All of these compounds can significantly elevate inflammation in the body, thereby increasing the likelihood of inflammatory episodes in the bronchioles. Gluten is also a bit of a double (negative) whammy in that it can elicit an autoimmune response in the body, which in turn can increase inflammation throughout and increase the risk of developing allergies linked to asthma. You’ve probably already heard about how magnesium is a mineral that’s critical for muscle relaxation, and the same is true for your lungs. Getting sufficient magnesium in your diet helps to relax your lungs‘ respiratory passages, subsequently lowering the frequency and severity of asthma attacks. The problem is, most foods are deficient in magnesium, so it’s worthwhile getting your hands on a high-quality magnesium supplement to ensure you’re getting your daily dose. Hey Buddy!, I found this information for you: "5 Scary Reasons To Stay Off Inhalers (And 3 Things To Use Instead)". Here is the website link: https://www.thealternativedaily.com/5-scary-reasons-to-stay-off-inhalers-and-what-to-use-instead. Thank you.